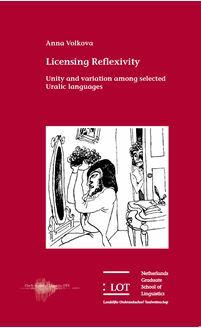 This dissertation analyzes the reflexivity patterns in Uralic languages from the point of view of a minimalist approach to binding . The languages under consideration are five Uralic languages spoken in the Russian Federation : Meadow Mari , Komi - Zyrian , Khanty , Besermyan Udmurt , and Erzya . The empirical data were compiled during fieldwork , and are used to test and assess current approaches to binding . The main focus of the dissertation is on a number of puzzles posed by these languages , namely the locally bound pronominals in Khanty , as well as the binding domains of what I call semi - reflexives and their ability to take split antecedents in Meadow Mari , Komi - Zyrian , Besermyan Udmurt , and Erzya . The analysis of reflexive strategies proposed in this dissertation is based on a modular approach to binding ( see Reuland 2011 ) . It disentangles the various factors playing a role in establishing interpretive dependencies , including properties of predicates and syntactic chains . The puzzling behavior of reflexive strategies under discussion is accounted for in terms of their morphosyntactic composition in tandem with general properties of grammatical computation . The present approach provides a unified basis for verbal and nominal reflexives . Overall , the study shows that cross - linguistic variation is not random . It demonstrates how descriptive fieldwork and theoretical research can be mutually beneficial and how their symbiosis deepens our understanding of the general principles underlying language , and the way these are rooted in our cognitive system .